For commercial roofing contractors with the experience to handle your large-scale, multi-family building project in Macon or any other nearby community in Georgia, make the smart decision and turn to the professionals at Arango Insulation. 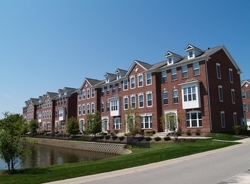 Our commercial roofers specialize in installing new roofs on structures like townhomes, retirement housing centers, condominiums, and apartment complexes, and we are trained and equipped to handle these types of commercial roofing projects regardless of their size or scope. Because of this, you can rest assured that when you choose Arango Insulation as your commercial roofing contractors, you are hiring a company with the knowledge and skills to get the job done right. Our technicians can install a wide range of systems for a variety of roofing styles, with flat or low-slope options like EPDM, PVC, TPO single-ply and Bitumen multi-ply systems, and steep-slope options such as asphalt shingles and metal (aluminum or steel) roofing. These roofing systems are manufactured using rugged, energy-efficient materials, making them incredible products that are built to last for years to come. To find out more about the advantages of hiring Arango Insulation as the commercial roofing contractors for your construction project in the Macon, GA, area, contact us today.